While there is no denying yoga's popularity as a form of physical exercise, the other life-enhancing aspects of this tradition remain obscure to many Westerners. 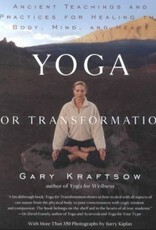 In Yoga for Transformation, Gary Kraftsow introduces techniques that treat not only the physical body but also the emotions, mind, heart, and soul of the practitioner-the places where real transformation can take place. There are breathing techniques to control energy levels, exercises to train and sharpen the intellect, and meditative practices to help increase self-awareness. With more than 350 black and white photographs throughout, this unique and accessible book is dedicated to strengthening the whole self-body, mind, and spirit.